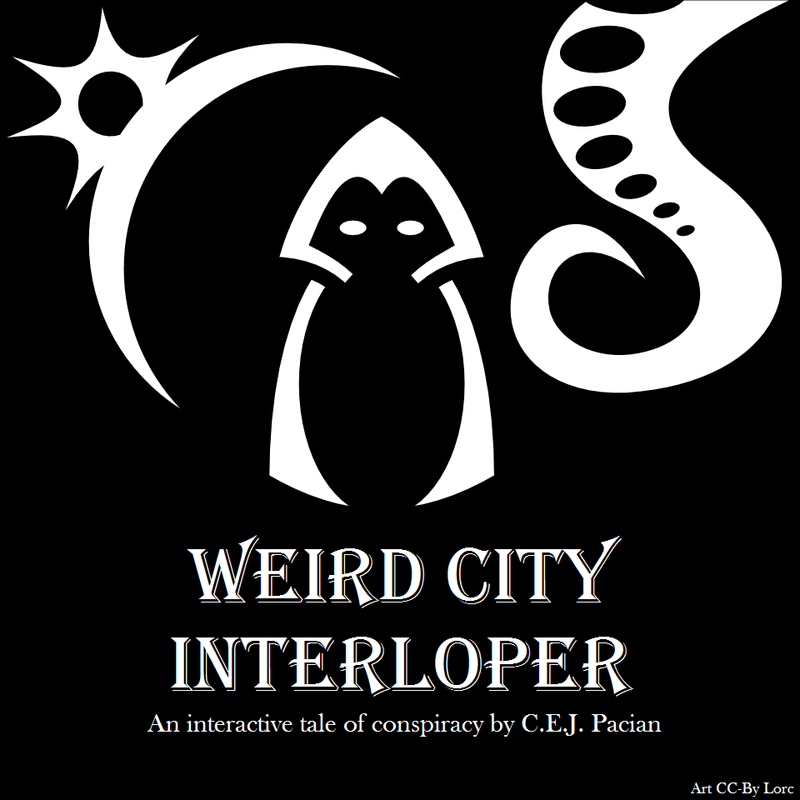 Weird City Interloper is a parser-based conversation game by Pacian. Like some of Pacian’s previous work, especially Castle of the Red Prince, it largely does away with the traditional object and room hierarchy: here instead of navigating between places, you are moving from one interlocutor to another. As you go, you accumulate an inventory of characters you know about and topics you can discuss, and the point of the game is to discover the story by asking the right people about the right sequence of things. Because those options are always enumerated (and initially the list is pretty short), it feels as though the game could easily have been executed as a choice-based experience instead; this is an interesting one to look at if you’re studying the parser-choice borderlands. The business of applying your topic inventory to different speakers sounds a bit mechanical, perhaps, and at some points it did seem as though I was just running around trying all my topics on all the characters. But at its best moments it felt much more organic than that, and several times it rewarded puzzle-solving leaps of intuition in a very satisfying way. The game also includes some well-timed help to give you hints if you seem to be lost, and this helped me past the couple of spots where I was feeling a bit stuck. Emotionally, I found the structure a little bit distancing. The protagonist remains obscure. We’re never shown our own dialogue, and all the narration is conversation directed at us, so we get no internal monologue, no view of what the protagonist wants. And the setting is so very alien that it’s difficult to fill in the blanks by guesswork. Weird City Interloper is set in a world where gods can be killed or imprisoned, where giant sentient snail-creatures can speak and one major character was originally made of mist. It’s a grotesque fantasy-verse with an emphasis on the distinction between the wealthy and the lower classes, and often reminiscent of the slime-and-carved-bone aesthetic of Porpentine’s work. There’s a “slimepriest,” among other characters. This is a very different experience from something like With Those We Love Alive or Their Angelical Understanding, though: even when we manage to win out in Porpentine’s stuff, it is often the result of desperately seizing an unexpected option, finding some loophole for survival, taking the only available route to escape. Here, by contrast, we’re steadily gaining in knowledge and power, and the narrative positions us as a person of some importance, even if we’re also an outsider to the oppressive system. This entry was posted in Conversation modeling, interactive fiction, parser, Reviews by Emily Short. Bookmark the permalink.